The short film Not, directed by John Bryan Evans, a former pupil of Ysgol Friars, has been nominated for Best Fiction and Best Welsh language film at Ffresh, the student moving image festival in Wales. John, 32, from Bangor, is currently studying an MA in Filmmaking after he gained a first class honour degree in Film Making here at the School of Creative Studies and Media. He said: “I am very pleased to be nominated but I was more surprised at first, particularly with the double nomination. The importance to have your work reviewed, critiqued and ultimately well received in this way is what a developing filmmaker like myself thrives on. “Not is a difficult film to watch and at times it was difficult to write and film. British film has a long and successful tradition of producing raw social drama so the film’s style was very much inspired and in the tradition of this ethic. “It would be amazing if Not won. I was nominated last year and it was great to have that feeling of being nominated. But I find I am closer to this film, a cliché but like it is one of my children. I'm very protective of it and at the same time very proud of what we all managed to produce. The crew were amazing and the cast were unbelievable, especially when you consider the difficulty of the subject. 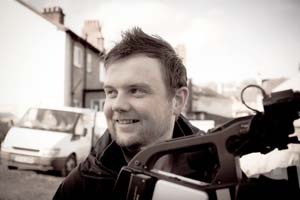 The Ffresh event, which showcases, celebrates and inspires students currently studying moving image degrees in Wales, will announce the winners during an event at Glyndŵr University, Wrexham from February 20th to 22nd 2013. Other students and graduates from the School of Creative Studies and Media involved in the production include Dewi Fôn Evans, Marty Hughes, Dan Hogg, Ali Brabbs, Michella Cortéz, Sera Mai Williams, Matthew Hughes and Dave Clarke.